When properly equipped, Traverse is rated for 5,200-lb. trailering, something its robust 3.6-liter V6 (281 or 288 horsepower, 266 or 270 lb.-ft. of torque) manages easily, and still has plenty of passing power. The available power-remote liftgate provides easy access to 116.3 cubic feet of maximum cargo space. 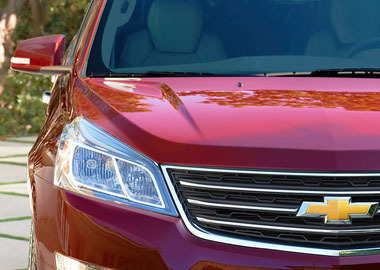 Under the hood, the Traverse LTZ has the power to go anywhere with 288 horsepower and an EPA-estimated 24 MPG highway. Including all the extras you need. Like supple touch surfaces, and ingenious Smart Slide® second-row seating which allows easy access to the third row. LTZ amenities include heated/cooled seats, tri-zone climate control and sliding armrest with storage. With 116.3 cubic feet of maximum cargo space and 24.4 cubic feet behind the third row, Traverse is a best-in-class crossover SUV. With a simple push of a button, the available power-remote liftgate makes loading and unloading a breeze. Traverse offers the technology you need to stay connected. With one standard USB port in the front center console and two in the rear, there are plenty of places to charge your devices. There’s also an available rear-seat entertainment system. Connect with available Bluetooth® wireless technology or one of the 3 USB ports to sync your smartphone or other compatible device. Stream Pandora® Internet Radio†, or take advantage of SiriusXM® Satellite Radio. And you can access your favorite music and media using touch controls or voice commands. A standard 6.5-inch diagonal color touch-screen provides easy access to information, And with the a press of a button on the steering wheel, iPhone users can access Siri Eyes-Free. 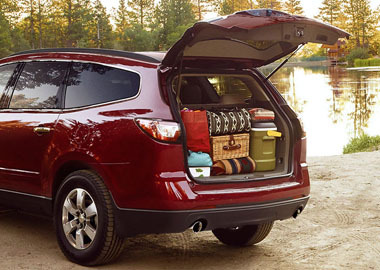 The 2016 Traverse is designed for a confident drive, inside and out. The innovative safety features of Traverse help make every road a safe one. Available technologies like an industry-first Front-Center Air Bag, Side Blind Zone Alert and Rear Cross Traffic Alert, as well as Forward Collision Alert and Lane Departure Warning, all work together to help you keep your family safe along the way.